The Vatican, her ten Catholic religions (kings, Rev. 17), their pope (whom Daniyl calls their mouth, Dan. 7:8), President Trump and Jared Kushner are entering a planned scenario of 3½ years that will become the worst in history. This time period will fulfill Prophecies written from Genesis to Revelation, exclusively for this time period referred to by the Savior, Yahshua Messiah, as the generation of the nuclear bomb. Yahweh’s Prophet Isayah was inspired to write abut a great burning caused by sin, that would only leave a few alive. Yahweh’s Prophet Malakyah spoke of the same time period that would burn as an oven; he showed that the few left alive would be those who reverence the Name of the Creator, Yahweh. Yes! Yahweh is the Name of the Creator. Yahweh created mankind and has a Plan for all who will choose to live Righteously, as did Yahshua, by Yahweh’s Laws of Righteousness. Yes! Yahshua is the Name of the Prophesied Savior. The Names Yahweh and Yahshua were replaced in the versions of The Book of Yahweh by the translators under order of the Vatican-the Roman Catholic Church-the popes. Read the history of the Name changes. Some time after the return from the Captivity, and before the beginning of the Christian era, the Jews came to believe that the Name YHWH was too sacred to be uttered on ordinary occasions. It was said to be pronounced by the High Priest on the Day of Atonement. The Jewish Encyclopedia, Volume 1, pages 201, 203, also points out this fact. The word Lord is a title of the rabbin, not a title of the Creator Yahweh. History shows that the Vatican used the same evil trick to replace the Savior’s Name. The Name Yahshua, meaning Yahweh will save His People from their sins, was replaced in all versions, such as the King James Version, with the names of two Gods. The Roman Catholic Church sits on seven hills—the seven hills of Rome. Read the Prophecy in your bible, or even better in The Book of Yahweh, which Yahweh released from the confines of the Roman Catholic Church. The release was made so His prophesied House would teach it in this generation, according to ancient Prophecies in your bible. Read the original Psalm 23 before they replaced Yahweh’s Name with the titles Lord and God. 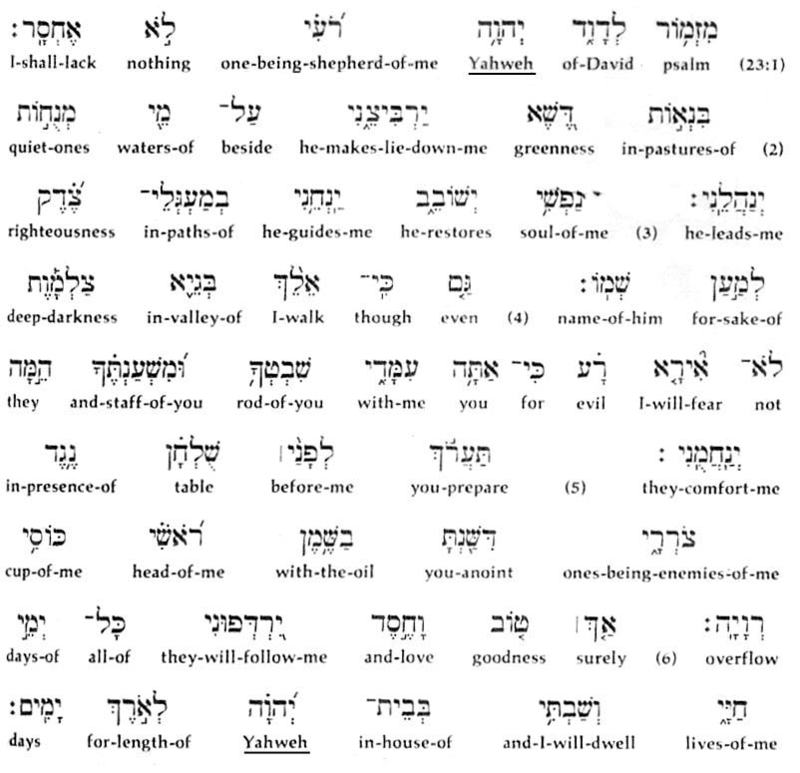 Read this Psalm from The New International Version Interlinear Hebrew-English Old Testament by John Kohlenberger III. You read Hebrew from right to left ß.
Lord and the Lord are titles of dead rabbis. Any bible dictionary, such as Unger’s Bible Dictionary, will show this fact. See clearly: when one prays to Lord or the Lord, they pray to dead rabbis. Jesus and Christ are both names of Gods used to replace the True Savior’s Name, Yahshua. The Roman Catholic Church is the leader of the kings of the earth. 17 But the Gods have put in their hearts to per­form their will; and to agree, and give their kingdom to the beast, until the words; prophecies, of Yahweh will be fulfilled. Verses 7 and 9 show the seven hills location. Verse 18 shows she is the leader of the earth. Verse 14 shows she makes war with Yahshua, the Lamb of Yahweh. The seven-year peace plan—the first half (3½) that was fulfilled and the last half (3½) that is yet to be fulfilled—is explained in our book, The Mark of the Beast, Volumes 1 and 2. You can read these books for free in the Yisrayl Hawkins Says program found at yisraylsays.com or yahweh.com. If you desire a hardcopy, you may obtain a set through yahweh.com, or call our office for ordering information. You can also find ordering information in The Prophetic Word magazine. You can read and download The Prophetic Word magazine for free on yahweh.com. We also recommend that you read our books, The End and Birth of the Nuclear Baby, which contain more details about this prophesied seven-year peace plan. The seven-year peace plan was signed September 13, 1993 by former President Bill Clinton, the last Israeli Prime Minister Yitzhak Rabin and the late PLO leader Yassir Arafat. It went into effect October 13, 1993. It is a plan of action, meaning it must be in effect for the time to be counted. Prophecy shows it would be shut down in the midst (middle). Half of the seven-year plan would be 3½ years. The remaining 3½ years are yet to be fulfilled. However, this plan is due to be signed back into action soon by the Vatican, her ten Catholic religions (kings, Rev. 17), their pope (whom Daniyl calls their mouth, Dan. 7:8), President Trump and Jared Kushner. They are going to be entering a planned scenario of 3½ years that will become the worst in history. In fact, Yahshua’s Prophecy shows this last 3½ years will be cut short for the Elect’s sake. This generation is seeing these things. Verse 3 shows The End. Verse 7 shows the extreme amount of dangerous disease epidemics, famines, environmental disasters, and fighting among the nations, which we see in the news daily. Verses 11–12 show 4,199 religions teaching iniquity and bringing on the wars. Verses 21-22 show this will be the worst time of trouble ever, so much so that Yahweh will need to cut short the nations’ activities and the 3½ years in order to protect His Elect. The House of Yahweh, in several Prophecies, is called the Protected Place. The congregation of The House of Yahweh is forming in every nation, and they will soon come to The House of Yahweh at Abel. I urge you to read our book, The Two Witnesses. Call, write or email to inquire how you may obtain a copy. The gathering is taking place as I write. If you desire to be a part, call us today to find out what you must do.